Page 16 – Canada. Under leg, last paragraph: "… as indicated on chart 3 over the last 3 sts on needle #1 and first 3 sts on needle #2, and the last 3 sts on needle #3 and the first 3 sts on needle #4, and work…"
Page 54 – New England. Under leg, first paragraph: "…35 sts on needle #2, 16 sts on…"
Page 54 – New England. Under heel, turn heel, Row 1: Sl 1, k1 over 21 sts, ssk, turn. Page 65 – Santa Fe. Under foot, first paragraph: "…Work foot chart for 17 rounds…"
Page 74 – Christmas in Tallin. Under leg, third paragraph: "Follow leg chart, decreasing 2 sts…"
Page 80 – Traveler's Stockings. Under shape leg, third paragraph: "…#3 and #4 (see chart 2)…"
Page 87 – Uinta Cabin. Under foot, shape toe, fourth line: "Second Decrease Round: *K5, k2tog; repeat from *." Page 95 – Whitby. Under shape toe, second paragraph: "…needle #1, k2tog, k1, K1, ssk at…"
Like the PDF format? 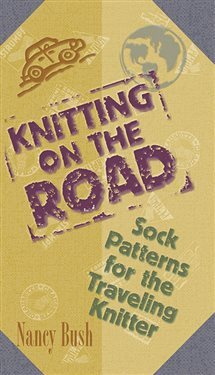 Find the Knitting on the Road ebook at the Interweave Store.